Retardant, like blood, in the right places is life-saving. I love watching it boil up into the hopper of my tanker. I wish I could touch it at times. Mesmerizing, but the disgrace of an overflow, with it’s possible airframe damage, keeps me alert. Knowing each individual pumping location helps. Some “roll-on” 10 gallons, some up to 50. Knowing when to extend my arm through the open window (to slow the pump), and knowing how fast and when to let it fall through the “cut it off” position is a key part of this job. Sounds truly simple. You want 710 gallons? Extend your arm at 680, start the drop at 690, arm all the way down at 700, you’ll end up with 710. Except when you don’t. Pit One gives you 15 gallons roll-on. Pit Two gives you 25-30, depending on the pump operator that day. The consequences of overfilling vary. Full of fuel, getting extra gallons can make leaving the runway difficult. Lower on fuel, thinking you can carry near the hopper maximum of 800 gallons…and you get too much….the hopper top “blows”, the retardant cascades down through the radio stack, all over the top of the wing…and your face is as red as the overflow. Retardant, like blood, is sticky as it dries. Much of my life has centered around blood. Patients hemorrhaging profusely from childbirth…from trauma…from surgery. Vivid images stay with me. An anesthesiologist called me at 0400 one day. A family practice doctor, with OB privileges, was doing a Cesarean section…and had ongoing hemorrhage. The patient’s hematocrit was down to 6%. “You mean her hemoglobin?” “Nope. Her ‘crit”. Hematocrit normally will be 30-40%. This was profound blood loss. I quickly rose, dressed, went to the hospital. The FP said “she’s not bleeding now…”. That was because she had little blood with which to bleed…. An emergency “C-hyst” was done. The girl lived to go home with her baby. One of the “saves”. Blood, like retardant, often appears to be less than it is. When the fall leaves are bright red, as they are now, the retardant seems to be hidden beneath the foliage. The brilliant hues confuse me, as I turn final to drop…..”where in hell is that line, anyway????”. Ah, thankfully it appears. I experienced momentary panic until I saw the retardant line from the prior tanker, made my drop, and got a brief “good drop” from Air Attack. The baby was tiny. 10 pounds. The diagnosis was as big as the child. Craniosynostosis. The “sutures” of the cranium, which in normal neonates allow the squeezing of the skull to allow passage through the birth canal, had fused prematurely. The pediatric neurosurgeon scheduled a revision…meaning the scalp would be peeled away from the bone, the bone chiseled open, and remodeled to allow the child’s head to normally develop. Induction of anesthesia was smooth. We “lined out” the baby…a couple of large IVs (the size you would put into an adult for major surgery), an arterial line…into his tiny arteries in his wrist, allowing a beat-to-beat measurement of his pulse and blood pressure. Importantly, it allowed us to measure “blood gases”, and his hemoglobin, throughout the extensive surgery. The surgery proceeded. Blood, like retardant, often appears to be less than it is. We transfused as needed…and over the next 8 hours gave the baby his entire blood volume twice over in replacement blood. At the end, he was stable. He went home with his parents to live a normal life, with a normally shaped head. The pediatric neurosurgeon told the parents that while the surgery was difficult…the reason their child did well was the pediatric anesthesiologist. A save. Fire, like disease, can smolder…or run rampant. Retardant, like blood, can help or hurt. 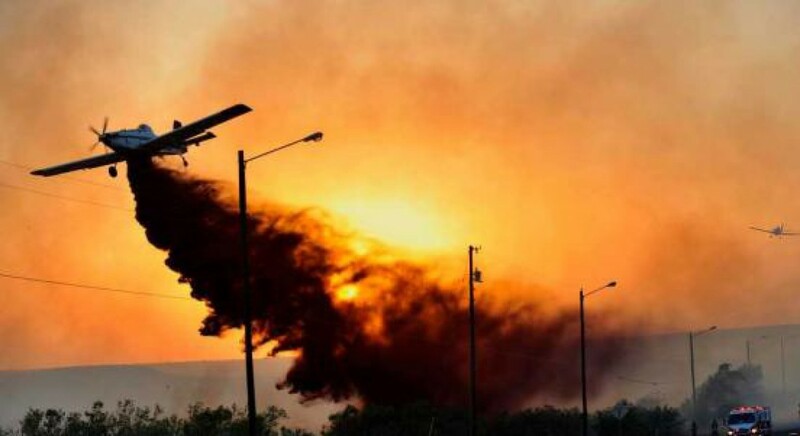 Two firefighters were killed this year when retardant caused trees to fall on them. Blood, like retardant, can avert catastrophe. I watch the retardant rise, fall, mound, then flatten as it rolls into the tank. I recall the blood I’ve seen fall on the floor, on the delivery table, on the operating room drapes. Red has marked the lines of my life.